As noted in our interview with Matthew Solomon, later this month there is to be a conference on Georges Méliès, news of which I hadn’t picked up on before now. It is to take place 25 July-August 2011 at Cerisy-la-Salle in France. 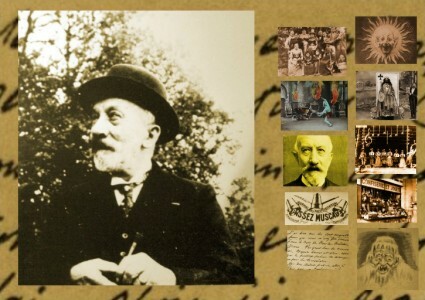 Méliès, carrefour des attractions has been organised by André Gaudreault and Laurent le Forestier, with the support of the Méliès family. It seeks to re-examine Georges Méliès’ position in early cinema history, whether as a precursor of subsequent developments in narrative cinema, spectacle, science fiction etc, or whether he is better understood as a product of the social, economic and legal practices of his time. The conference site has abstracts for each of the papers (in French). There is further information, also in French, at something else that is new to me – what is billing itself as the official Georges Méliès site (www.melies.eu). On quick inspection it contains a biography, a rudimentary filmography (without catalogue numbers), a family tree (handy), links and entertaining associated information (including a listing of the remarkable number of French streets named after Méliès – can any other filmmaker have been so recognised? ), bibliography, news and images. The site has been put together by Pauline Duclaud-Lacoste Méliès, who (the family tree tells us) is Méliès’ great-great-granddaughter. It isn’t anywhere near the great, comprehensive and useful website that an artist of Méliès’ standing ought to have by now, but it’s maybe a little better than what has gone before. If only there was as much attention paid to Méliès by our website builders as there has been by France’s road builders. Is Michael Brooke’s website on Méliès still in reconstruction? Thank you for you comments about my website. I agree with all of them. I will be very pleased to have a website with more informations, videos and links BUT I’m not a graphic designer or a webmaster. This website is a first step before a bigger one. So If you know, for free (as you know, our family always paid everything but herself), how to build a beautiful official Georges Méliès website, I will be very happy to take this option. Thank you for having got in touch, and congratulations on what looks like a very professional site for a non-professional. I hope you are able to build on it in a manner that befits Georges Méliès’ status as a great artist. You have made a good start with the web address alone. Karel – I assume Michael Brooke feels unable to put the time and effort into completing his Méliès filmography that he exhibited, perhaps a little too keenly, when he started i.e. he probably set too great a task for himself. So I expect it is going to remain an unfinished work.